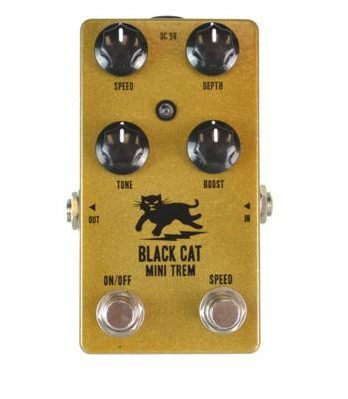 The Black Cat Mini Trem is a dual function tremolo/clean boost in one pedal. Part of the legacy of the original Black Cat line, the new Mini Trem sports some additional features and a spiffy new look. At the heart of this pedal is a classic, sixties-style tremolo with Speed and Depth controls. The circuit also incorporates a clean FET boost with controls for Boost and Tone. Finally, we�ve added a second stomp switch that allows for half-speed/double-speed switching, and an LED that flashes in time with the rate of the tremolo. The tremolo and clean boost effects can function independently of one another, but the Mini Trem really shines by using the combination of all four controls, which yields the widest variety of tones and timbres available in any stompbox tremolo. The Black Cat Mini Trem lets you �voice� the sound of your tremolo, from a deep and swampy throb to a sharp staccato stutter.